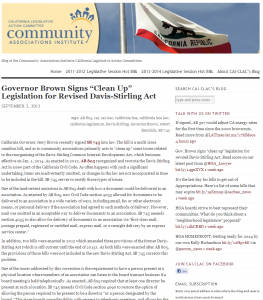 I recently submitted a guest post on the CAI California Legislative Action Committee (CLAC) blog regarding SB 745, the “clean up legislation for the revised Davis-Stirling Act, which goes into law on January 1, 2014. You can read the post and my analysis of how SB 745 addresses several omissions from the revised Davis-Stirling Act here. Previous Previous post: What Does it Take to Amend the CC&Rs?